The East Bay now has its first public bike park: Dirt World, in Richmond, California. Please come check out our park! We have a two-rider BMX practice track, four separate jump lines, a dirt quarter-pipe, and a pump track. We are located next to the McVittie Post Office Annex and between Chanslor and Ohio avenues, and 20th and 23rd streets. You can use the address 4 21st to navigate or just plug Dirt World Bike Park into Google Maps. We are open from sunrise to sunset, 365 days a year. * Bikes only. No motorized vehicles or RC cars. * Helmets required. No exceptions. * Pedestrians should stay off tracks and jump lines. * Children 8-years-old & under must be accompanied by an adult. * Please don’t ride when wet — it’s dangerous and destroys the tracks and jumps. * Smoking & alcohol are prohibited within the bike park. Code 831.7. Ride at your own risk. * All other City of Richmond Park rules and regulations apply. Dirt World is a public park on the Richmond Greenway. It was built with the support and blessing of the City of Richmond, as well as the help of many community organizations, including Groundwork Richmond, Friends of the Richmond Greenway, the Watershed Project, Bicycle Trails Council of the East Bay, and Bay Area BMXers. We are open from sunrise to sunset, 365 days a year. The construction of Dirt World was led by Action Sports Construction, one of the nation's top design-build firms for bike parks and tracks. Construction costs were underwritten by dozens of individual donors and companies, notably Title Nine, Overaa Construction, Richmond Rotary, Ice Chamber Athletic Performance Training, Vallier Design Associates, Ghilotti Brothers Inc., the Ida & William Rosenthal Foundation, Dante Buckley, Love Your Block Richmond, and Kids in Motion. We opened on July 13, 2018 and have since welcomed hundreds of riders of all ages and abilities. Though we are now open, we are still getting everything dialed in, so please bear with us. We will be planting more trees, installing permanent signage, building a plaza with seating, putting in more garbage cans, etc. We would love your support and volunteer energy to make the park perfect. If you want to get involved, please drop an email to info@dirtworld.org or message us on Facebook (you can click on the icon below). Our big grand opening party is scheduled for Sept. 1, 2018, so contact us if you'd like to participate. This page will be fully revamped shortly, but for our Facebook page has the most up-to-date info on the park. 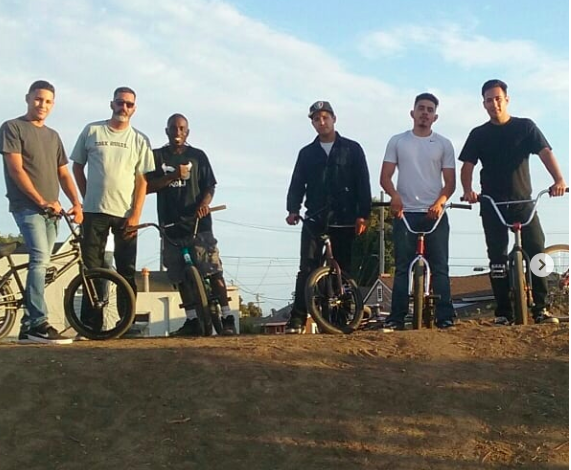 Grom Nation enjoying BMX summer camp with Dirt World volunteer Howard Cato.